Located just off Interstate 5 and three miles southwest of the Snohomish County city of Arlington, Washington; the Arlington Municipal Airport is operated by the City of Arlington. The airport has two asphalt paved runways – 16/34 measuring 5,332 x 100 ft. and 11/29 measuring 3,498 x 75 ft. and covers an area of 1,189 acres. AWO is a busy, well supported airport and is home to many corporate and decommissioned military aircraft, vintage planes, experimental aircraft, helicopters, gliders and ultra-lights. Like many small airports in Washington, Arlington has a strong military history. Built by the City of Arlington and dedicated in 1935 it later became a US Naval Auxiliary Air Station and was decommissioned in 1945. The airport is listed on the National Register of Historic Places. 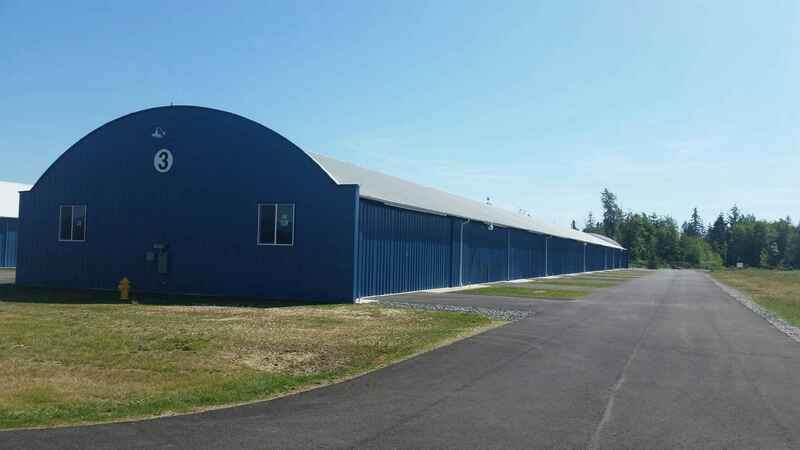 Carrera Hangars LP builds and leases quality Aviation hangars. The hangars are located on the East and West side of Arlington Municipal Airport, Each building contains multiple hangar units in various sizes and designs. Each building is constructed on concrete floors with vapor barrier; steel hung rolling doors that are fully insulated, eight foot ballast lighting with ample electrical power and compressed air. During our construction we had the pleasure of working with many material suppliers such as Smokey Point Concrete, Probuild Lumber, Tri County Truss, Metal Sales, SPI Winroc, Building Specialties & Arlington Hardware. Building #3 has 19 T hangar units varying in size dimensions and square footage. The standard T hangar is 40’ wide x 32’ deep with a 25’ wide tail section and will easily accommodate a twin-engine aircraft. Lease rates start at $335.00 per month and up depending on the size of the unit. Leasing documents can be downloaded below. To view our hangar lease information, please click on the link below.